Training for half marathons vs. full marathons is very different. The biggest of which, for me, has been the time commitment. For half marathons my weekend long runs were never much longer than two hours. Now I block out a full 5 hours for my 20 mile runs. But coming home to compression socks, a giant water bottle with Nuun and a fire in our living room is pretty much priceless. Potty breaks are essential. 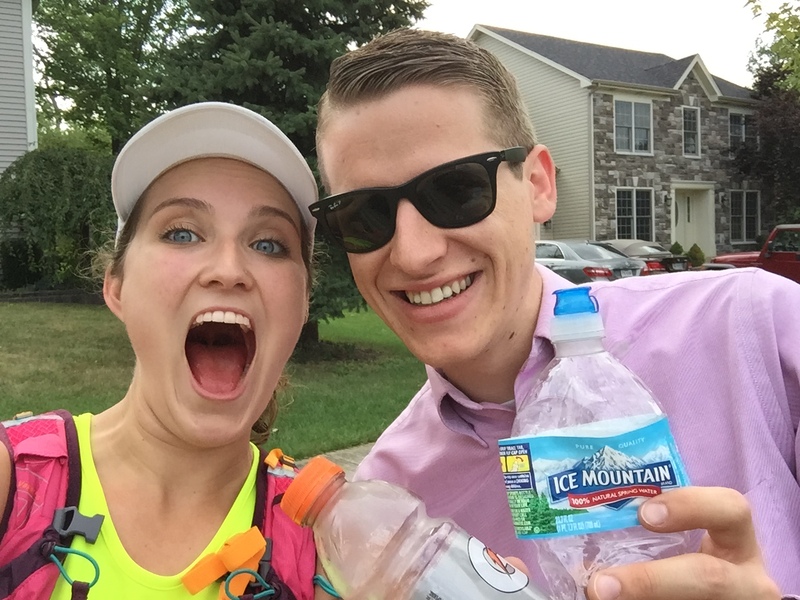 When you run for two hours they can be skipped, but with the amount of hydration needed for a few long runs in the heat this summer, it just can’t be avoided. I’ve never been happier than to see the porta-potty at mile 9 of my first 18 mile run. Boy did I need to pee! Chaffing will happen. Anywhere you think it can happen, it will. Vaseline or BodyGlide will be your new best friend. Let’s just leave it at that 😉 Just throw it in your running pack and thank me at mile 18. Nuun! If you haven’t tried it yet for your endurance events (or hot yoga too! ), then swing by your local Whole Foods and pick up a few tubes. They’re small tablets of electrolytes and vitamins that dissolve in your water bottle (and they’re flavored!). They don’t give me as much instant energy as drinking water mixed with gatorade, but Nuun does a better job of keeping my fueling consistent, without the ups and downs that come with more sugary drinks. While eating three Gu packets during a half marathon is doable, eating 6+ on a long run tastes pretty gross. I’ve learned to add mini pretzels to my running pack to mix things up. I’ve also brought gummy bears, chips, bananas and goldfish. When I load up my running/hydration backpack for long runs it looks like I’m leaving for a long weekend, haha! Thank goodness for an emergency Gatorade and water drop-off by Hubs during a particularly hot run. I thought my hydration pack would hold me through, but with 5 miles left I realized I’d need more to drink. Behold the wonders of Google Maps and the ability to pinpoint the exact neighborhood I was in 🙂 Thanks for answering my SOS, Hubs! Quick pit stop along the route of my first 15 mile run. 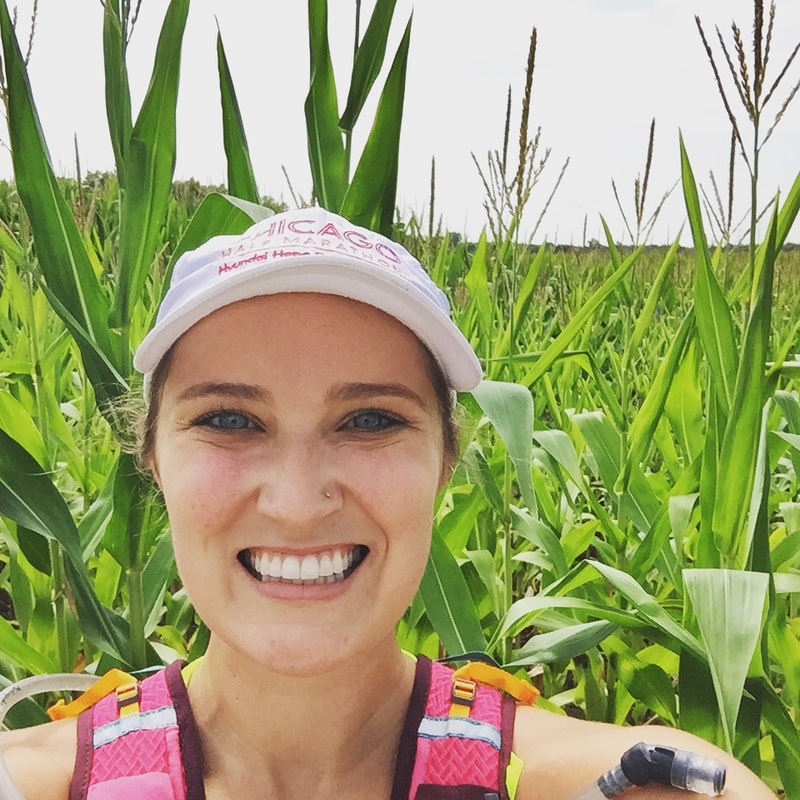 You know you’re an IL runner when you literally run through corn fields! My first marathon will be run in support of A.D.O.P.T. Pet Shelter in Naperville, IL. Want to be part of the fun? Your donation will go towards housing, feeding and caring for pets in need! Contribute to help pets in need here: https://www.gofundme.com/runwithpup1182015. Next postOperation First Marathon, Complete!